A lost railroad; a daring rescue attempt; Georgiaville cave dwellers; a potential Uranium mine; and a four legged chicken! Historians are constantly searching for forgotten tales that have been overlooked and unreported since they happened, but sometimes a story doesn’t contain enough material for an entire article, but can be interesting none-the-less. In May of 1900 it was reported that Abraham L. Mowry of Smithfield had a chicken that was born with four legs. The bird, it was said, relied primarily on its forward set of its legs, keeping the other two in more or less a “reserve” status. The fowl was brought to “the Kingston College” for further study, for it was hoped the anomaly could be breed so that chickens might come to the table with four drumsticks instead of two. Unfortunately for chicken lovers, history has shown that this experiment never “panned out” so to speak. On March 2, 1907, twenty five lodgers at a boarding house belonging to the Bernon Cotton Mill in Georgiaville were overcome by toxic coal gasses and would likely have died had it not been for the actions of one man. Michael Beenville, one of the lodgers, awoke that morning and found the house unusually quiet. When he went downstairs to have breakfast and found no one there, he knew something was wrong, and ran to the mill to get help. He returned with the mill superintendent and a doctor who began pounding on the apartment door of Otis Pratt, the proprietor of the boarding house. When neither Pratt nor his wife answered, they broke down the door and found both unconscious in their bed and the room full of poison gas. As the doctor attended to the couple, the other two men began moving through the building opening windows and rousing other tenants. Some required more assistance than others, the most serious case being a man found near death having slipped into a deep coma. The doctor did not expect him to survive, yet fortunately he awoke twenty-four hours later and made a full recovery. The problem occurred when a tenant went into the cellar the night before and filled the ancient and decrepit furnace with a large quantity of coal, and then for some unknown reason closed off all draught vents which gave the poison gas no place to vent except upwards and into the apartments. Had it not been for Mr. Beenville, this might have been the worse mass-casualty incident to ever occur in Smithfield. Apparently Georgiaville has a cave, for according to a 1909 Woonsocket Call news article a 27-year-old man and a 14-year-old girl were found living in a cave somewhere in or nearby the village. The couple had been there at least three weeks living off what poultry and vegetables they could “forage” from local farms and gardens. The cave was “furnished” with a pillow, a mattress of dead leaves, and a blanket. The man told authorities that he and the girl had been together for nearly a year, traveling from place to place occasionally finding work in mills and factories. Of late, he had been unemployed and therefore unable to pay rent. That’s why they had taken up residence in the cave. The girl claimed she was from Whitman, Massachusetts, and although she gave her age as fourteen, it was reported that she looked “considerably older”. Did she lie about her age in the hope of avoiding time in the Georgiaville lockup? With the passage of so many years one can only speculate. In any case, both were held for further questioning while local constables contacted Massachusetts officials to verify information. It’s likely that the “cave” on question was not a cave in the classic sense, but more likely a portion of a granite outcrop that was hollowed out by the glacier during the last Ice Age leaving behind a small natural shelter. Such “caves” can be found elsewhere in Smithfield however, research has failed to discover the location of this one. Perhaps there is a reader who knows the answer. It’s a sad fact that nearly every body of water in the town has had at least one drowning as evidenced by early town death records. Before improved highways and reliable automobiles provided for easy access to the state’s shoreline beaches, many people swam in local rivers and ponds as a way to beat the summer heat, and in winter time the ice wasn’t always safe for skating. On August 13, 1908, a 25-year-old man got into trouble while swimming on Georgiaville Pond, and 16-year-old Alphonse N. Gagnan swam out and attempted to save him. As Gagnon tried to help, the man threw his arms around the boy and the two of them sank below the surface. There on the bottom Gagnon found himself fighting for his life while trying to break free of the desperate man’s “death-hold”. Alphonse eventually won his battle with the aid of a friend, but had to be helped to shore for the ordeal had sapped all of his strength. The man’s body was recovered later. For his efforts, Alphonse was awarded the prestigious Carnegie Medal of Heroism, which came with a one-thousand dollar prize – a huge amount of money for the time. Follow-up information about Alphonse Gagnon was found in a1920 census, where it was indicated that he was married with three young children, and still living in Georgiaville. It is well known that Smithfield once had a railroad which passed through town, and it’s also well known that at one time trolley tracks ran along some of our major thoroughfares. Yet how many have ever heard of the “Harold Parkinson Great Smithfield Railroad”? Harold Parkinson was a man of great ingenuity. He lived in a house on Route 44 in the area between Route 295 and Esmond Street. His sister and her husband lived next door about three-hundred feet away. Parkinson had once worked for the Great Northern Railroad in England, and during the 1930s he came to Smithfield where he found a job at Esmond Mills. However, railroading was in his blood, and one day the idea came to him to build a scaled-down version of an actual working railroad For most people this would have meant a small Lionel train set in the basement, but Mr. Parkinson had greater plans. Over the course of two years, from 1938 to 1940, Parkinson collected parts, custom made others, and hand-built a twelve foot long, two-ton English style locomotive, capable of generating 500 pounds of steam pressure. The boiler was heated by two gallons of kerosene which could keep it stoked for up to twelve hours. 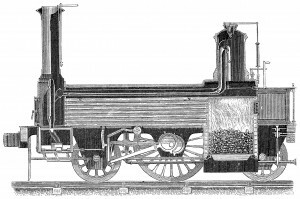 Parkinson also designed a small passenger car to be pulled behind his locomotive, thus allowing him to “commute” to his sister’s home and back on a 300 foot loop of custom built track. The engine was kept in its own specially built shed constructed over the tracks, with a door at each end – one to enter – one to exit. Unfortunately all traces of Harold Parkinson’s Great Smithfield Railroad have vanished and commercial businesses now occupy the area where homes once stood. One unsolved mystery is the final disposition of the locomotive. It seems highly unlikely that such a hand-made one-of-a-kind piece would simply be scrapped; at least one would hope not. Perhaps it still exists, maybe in a museum somewhere. Can anyone solve the mystery? The following story involves what the press termed, “Atomic-era Gold”, or Uranium as it is more commonly called. Smithfield is not generally considered an area rich in geological minerals and gems, but in July of 1957 three local men announced the possible discovery of a rich deposit of Uranium ore embedded in a rocky hillside overlooking Stump Pond. After receiving permission from landowners, samples were excavated and sent for analysis. Uranium is radio active and was highly sought after during the so called “Cold War” between the United States and Russia for its nuclear applications. It was reported that the United States Government seemed interested in the Smithfield find, and indicated that if the ore turned out to be of good quality they might purchase it. It was also reported that the Atomic Energy Commission sometimes gave bonuses of ten to thirty thousand dollars for such finds, which even today is considered a lot of money. Unfortunately, the ore samples were not what the government was looking for, and what initially appeared to be a promising mining venture for the town faded into history.